Bryson DeChambeau produces a great escape from water and ruins trousers! Bryson DeChambeau was regretting his decision to wear white trousers for the final round of the Hero World Challenge after getting into a mess on the 12th. 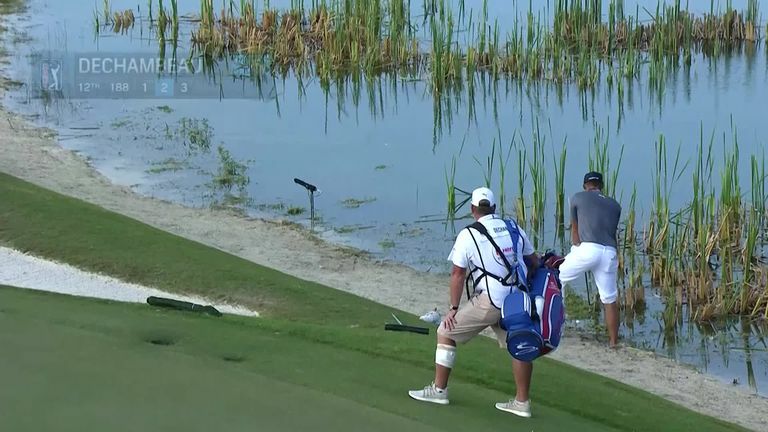 DeChambeau pulled his tee shot to the par-three left of the green, and his ball rolled through the sand and into the water hazard to leave him staring a penalty drop in the face. But "The Scientist" opted to make a splash as his ball was only partially submerged in the lake, and he felt he could get it back onto dry land after removing his right shoe and sock and rolling up his trouserleg. And his ambitious endeavour was rewarded when he made great contact and managed to stop his ball 10 feet from the flag, although he was unable to hole the par-saving putt. However, the impact of wedge on water and the muddy surface below had a devastating effect on his pristine white trousers, and required a lengthy clean-up operation before he could complete his round. What's wrong with De Gea?